There is a mid-summer bloom of cheerful orange at the edge of our side yard, where the forest meets the lawn. 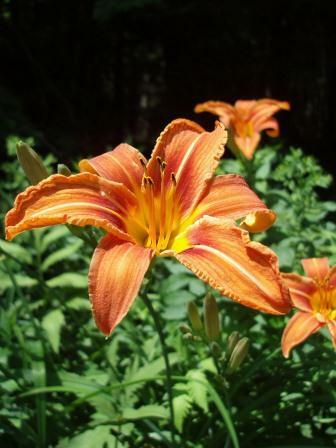 In that otherwise dull corner, a group of bright day lilies grows tall as the days grow hot, bursting into a flame of color each July to reveal somebody else’s patch of flower garden. Walk through the woods about anywhere in northern New England, and you’re likely to stumble upon a centuries-old cellar hole, or notice a bulging line of mossy earth below which lies a forgotten stone wall, or find yourself in an old apple orchard gone wild with time. Those are the obvious indicators that someone once dwelled where you roam, digging that cellar by hand and storing root vegetables there for the long winter, painstakingly prying rocks from the ground to create a pasture or garden plot, tending apple trees to grow fruit for eating – or for fermenting into hard cider. Open your eyes a bit wider, and you’ll also find the flowers of gardens past tucked into the woods and along the edges of uncultivated fields. They suggest a memory of the finer things in life: afternoons puttering in the garden, new blooms picked for a table set for the company of friends, fresh herbs plucked for seasoning dinner. The stone walls and helter-skelter apple orchards, lilacs and lilies, are pieces to a puzzle whose answers are buried in time. Who lived here? When? For how long? Why did they leave, abandoning a house, a pasture, a garden of perennials? I’ve noticed lady’s mantel and wide swaths of forget-me-nots bordering the back roads where I run, small patches of bright purple irises growing through scrubby weeds along old stone walls, even daffodils popping happy yellow heads through forest undergrowth as the snow recedes slowly in springtime. At our house, the gnarled lilac bushes along the driveway faithfully produce purple blooms each May, around the same time snowy white apple blossoms fill the back field. The apple trees, we were told by the former owner of this house, were planted during Prohibition to produce hard cider. Perhaps once they formed neat rows, but now they grow in an unruly jumble. In summers when the field has not been mowed for a couple of years, thick brambles of blackberries grow beneath the apple trees, creating a feast for the bears who ramble through each late summer and fall, bulking up for winter. Bishop’s weed grows with abandon (as Bishop’s weed will) down the slope from the driveway. Vast patches of yarrow frolic through the fields. A thick stand of tansy, used in Colonial times to season food in place of sage, claims the narrow hill above our vegetable garden. I know little of the human history of this piece of the earth. It seems probable that it was once pastureland, and there is plenty of evidence of old stone walls, buried now in tall ferns and prickly berry bushes. The house was built in 1929, and we are the fourth set of inhabitants to live in it. The woman from whom we bought the house and land created a large perennial garden in the front yard, taking full advantage of the southern exposure there. We’ve altered that garden, pulling out the ajuga, which continues to grow freely in the lawn, and the ornamental grasses, some of which have transplanted themselves into a tall, oblong patch in the field. There are plenty of Stella d’Oro daylilies in that garden now – amid the astilbe and hosta, the rudbeckia and evening primrose and sprawling baptisia – but none of the big orange lilies that thrive beyond the edge of our lawn. I’ll probably never know who planted those lilies, or what once grew alongside them. Were they part of a garden, or did they travel there on their own? Were they planted the same time as the heirloom lilac bushes and apple trees? And what, I wonder, will future inhabitants of this place uncover from the plants I tend today?